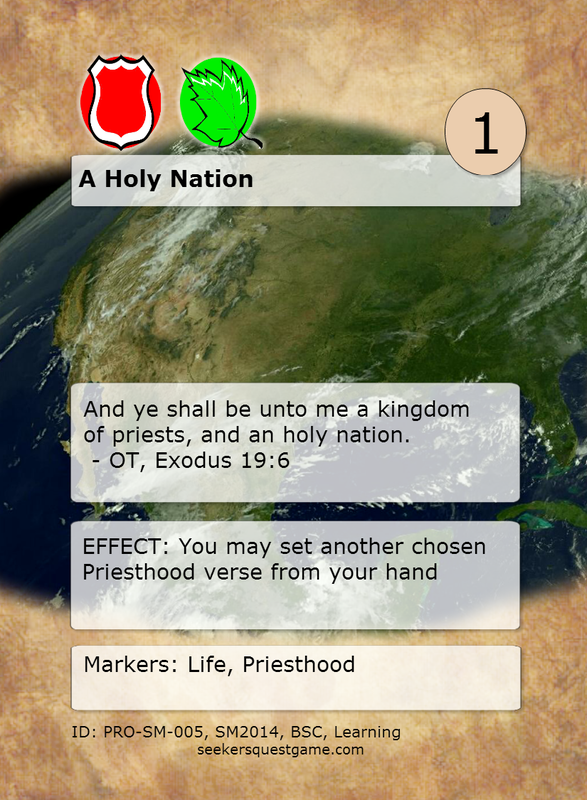 Verse Rule: During your turn, you may give this verse from your hand to another chosen player's hand. You may then set one chosen verse from your hand. In the making of the game, we tried to a number of things that would make Seeker’s Quest be both cooperative and competitive. We wanted to reward actions that benefited your opponents by giving you benefit as well. This verse is an example of that. Verse Rule: EFFECT: Seek: "Man/Men"
We, as members of the Church of Jesus Christ of Latter-Day saints believe that God has always spoken with prophets. He did so in ancient days, and he does again, now. 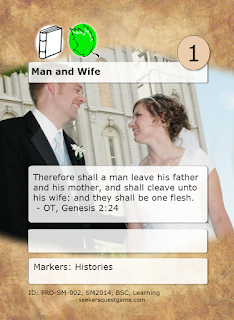 Combos, tips: This is a great verse to use to fetch up The Work of God or The Glory of God. 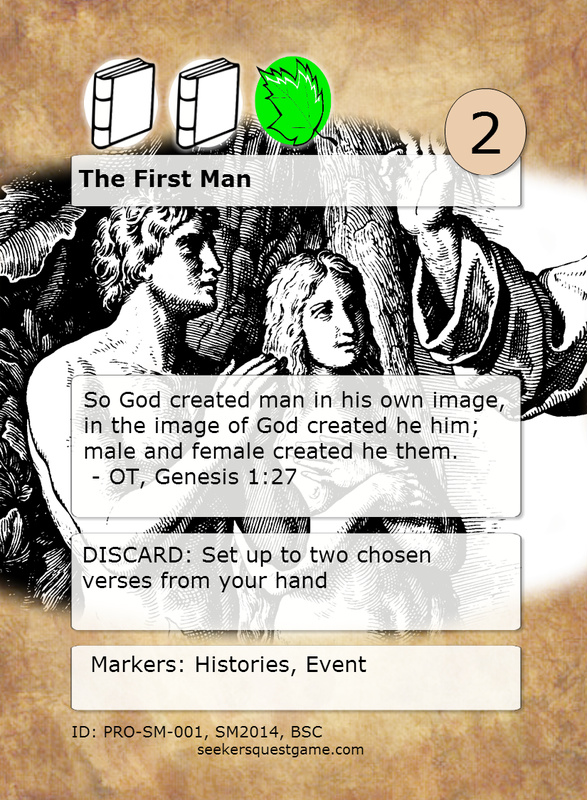 If you have both of these in a chapter, you can close it up as a book, regardless of the icons. 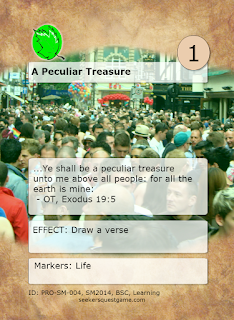 Having a verse like this one to get those two verses into your hand can speed up that process! 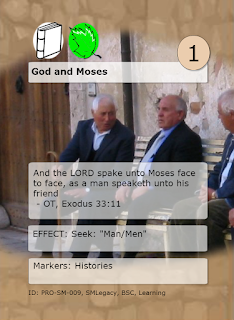 Errata: Revised, verse rule previously read: EFFECT: Keyword: "Man/Men"
Here’s another verse from the 10 Commandments. 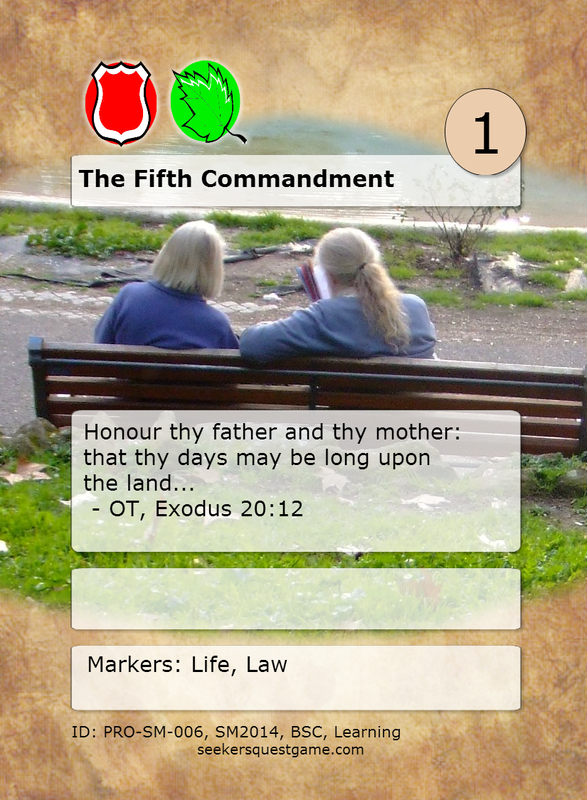 It’s a Law verse, because, of course, Moses is The Lawgiver. 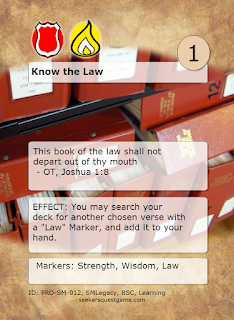 There are other verses (like Know the Law) that let you seek or set Law verses, so it could be a good basis for a deck! This verse’s rule keeps an opponent from “killing” one of your key verses. This would be a good one for a Law deck, with a lot of the other 10 Commandments. It usually doesn’t work, but I think it’s funny. As The Lord was instituting his law with Moses, he clearly saw a need for organization. He established those that were authorized to act in His name. This has always been through the Priesthood. There are a number of verses with the Priesthood marker. 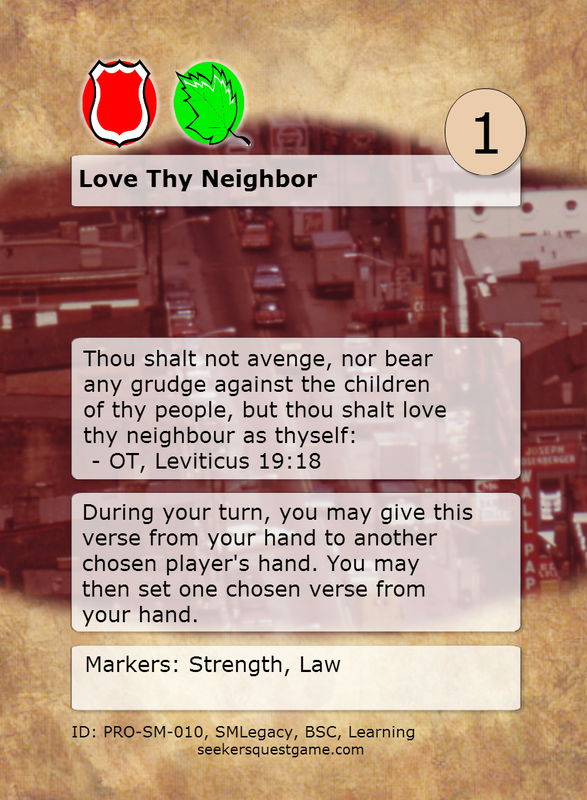 If you’re building a deck and using this verse, have a few more of them, and several copies each. 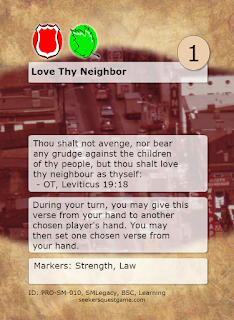 That way, when you play this verse, you’ll likely have one in your hand to drop. This is a great story. 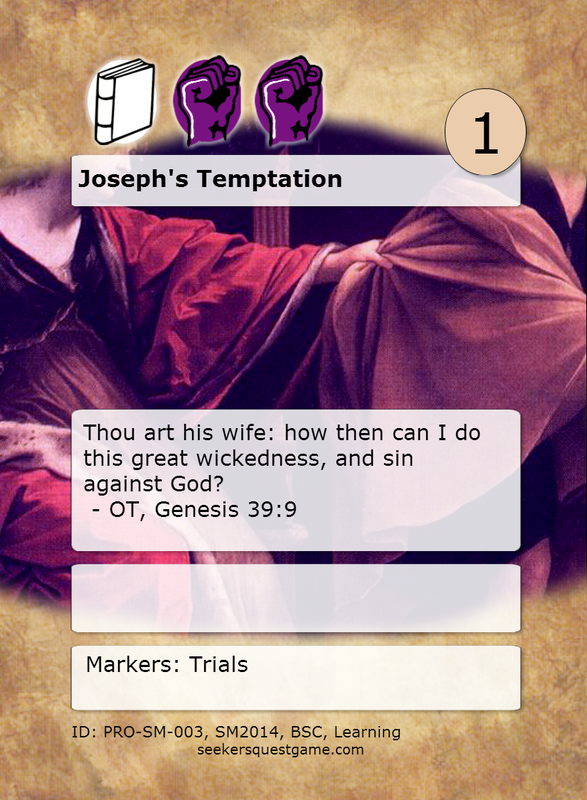 The art for the card came from a classic painting of Joseph running and Potiphar’s wife grabbing his cloak. Not only was the temptation a trial for Joseph, but it started his time in prison, another trial! In play, this verse will give you two Trials icons for only a 1-drop sacrifice cost. This one is based on the idea that God created Adam and Eve. 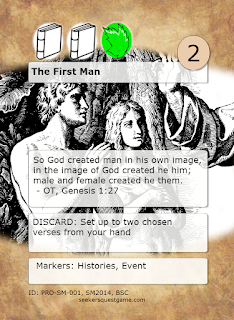 In like manner, you get to set two verses into a chapter. 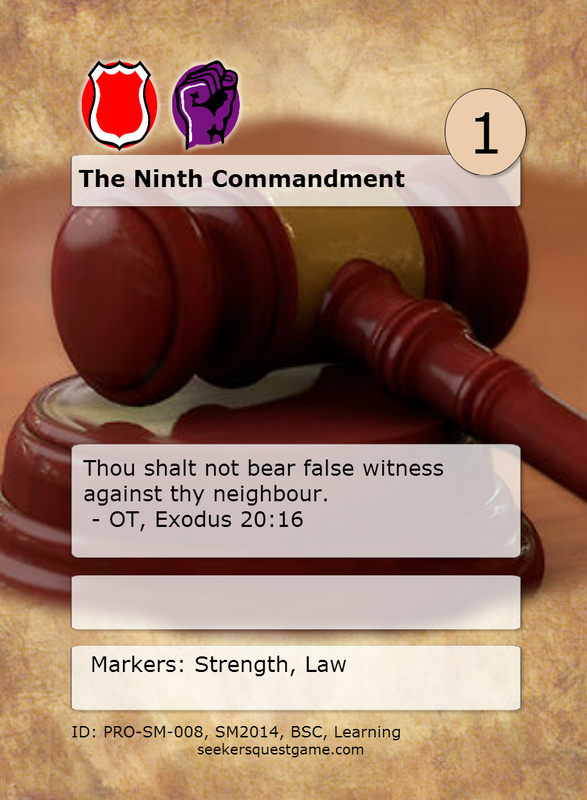 It’s a good way to get a few additional icons into a chapter without a lot of cost! The cool thing about this is that you can do it in a gap, even in an opponent’s turn. Is he or she about to close up a book that you have no verses in? Drop a couple! Maybe he or she has more icons in it than you do. You can even it up or surpass, and get the extra blessing! Or maybe your opponent ends his turn, and you’re about to start with too many verses in your hand! Yikes! You don’t want to add those to your blessing stack. In the gap between turns, discard this one, set two more, and suddenly you’ve dropped three verses from your hand, and you’re under the 7-verse limit! Title of Liberty Playtesting is Underway! I've been very excited! The first four playtest games of Seeker's Quest - Title of Liberty have been quite successful and very revealing! 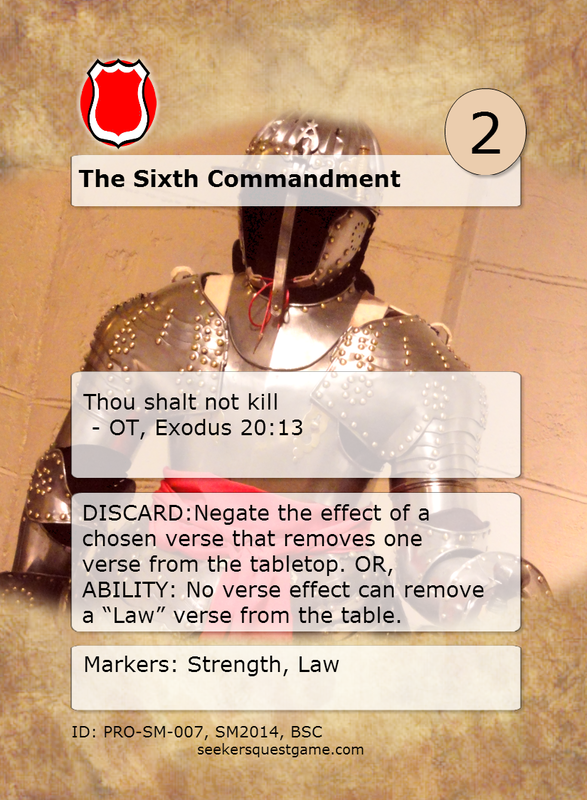 The first tests have been using only TOL verses in randomized decks. 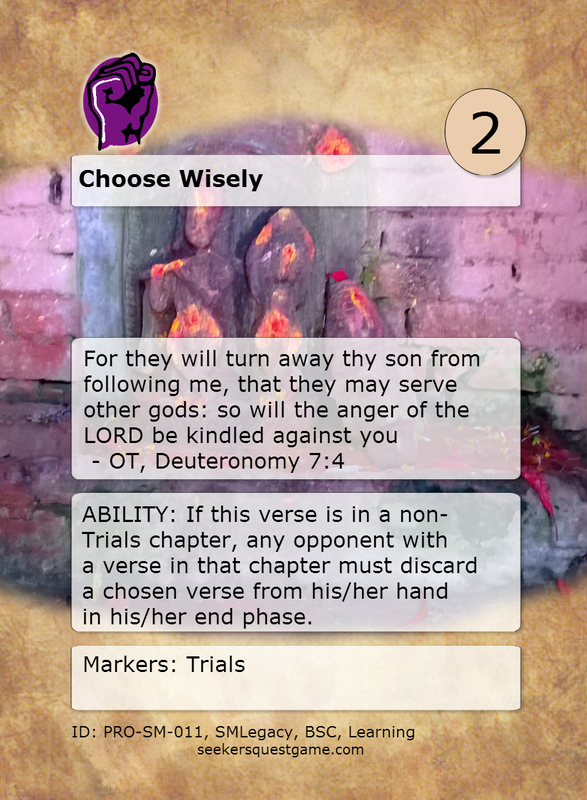 Once I feel that the set is functional, consistent, and unbroken, then we'll do some testing with mixed decks (including verses from the Scripture Mastery set). Since there's not as many draw or seek verses in this set, the play is very different. Also, a lot of the verse rules play well within specific stories, so I think they cater to preconstructed decks moreso than the SM set. All of that tends to lend itself to play that's more focused on icons and books than on combos so far. We'll see how that plays out once we get into testing with precon decks. I'm particularly interested in how a battle deck will play out. I'm a bit afraid that it might be broken in a precon deck. We'll have to see! That's what platesting is for, right? If anyone is interested in cutting out some cards and trying it at home, I'd sure appreciate it! Contact me at mrkhmusic@yahoo.com, or leave a comment below, and I'll set you up! In the meantime, at the left, click to follow our facebook page! 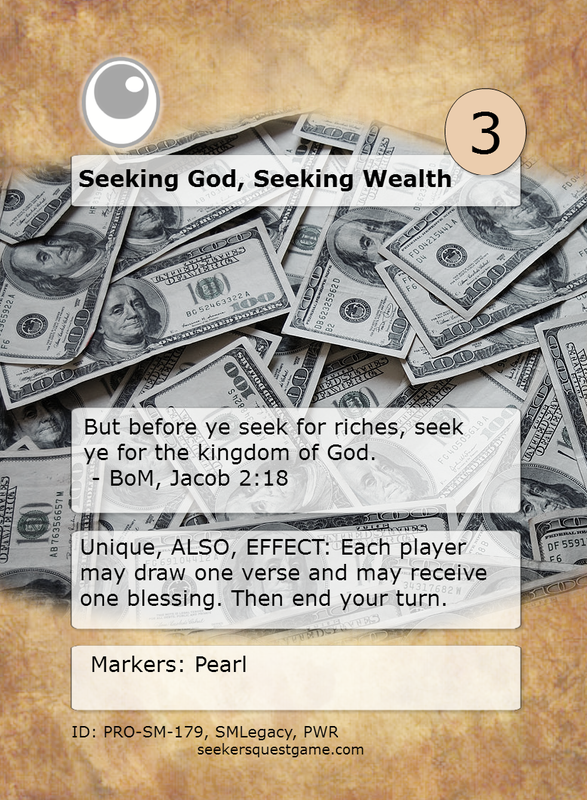 So, this week, I was all excited to start working on the Title of Liberty cardset, printing them out and getting them cut and sleeved, ready for playtesting. By the way, if you want to help playtest, just email me! 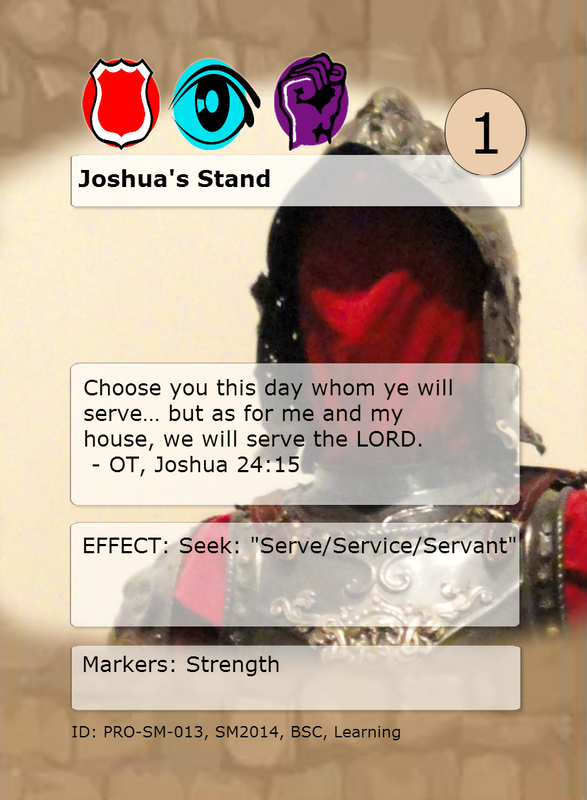 Then my son and I were talking about decks from the Scripture Mastery set, and he started wondering out loud if he could make a One-Turn-Kill deck. In Yu-Gi-Oh, that's where you kill off your opponent in, obviously, one turn. In this case, it would be a One-Turn-Win, since nobody dies in Seeker's Quest. I thought, No way. It can't happen. 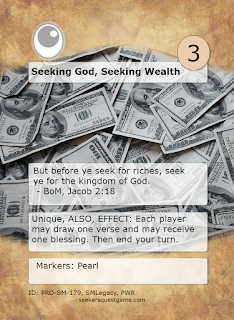 I've set all of the verses where you receive blessings to have high sacrifice costs. But he thought that he could get enough draw verses going to overcome that. I was still skeptical, but I was, honestly, scared. Well, to shorten the long story, he did it. 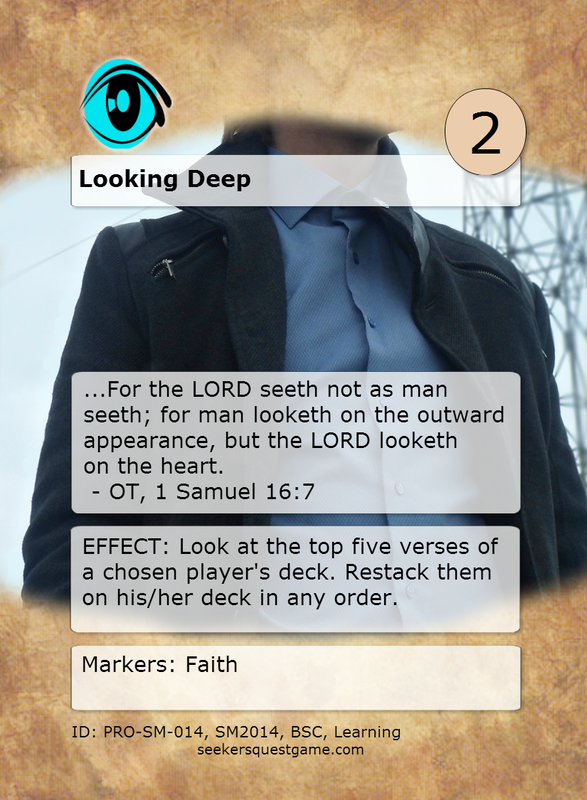 It was a wicked deck, filled with verses that allowed him to draw blessings, and verses that allowed him to draw verses, both from his deck and the discard. Three games in a row, he won before I even got a chance to freeplay my first verse. In the game design world, this is known as "Breaking the Game". 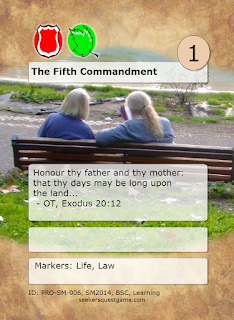 I would have been thrilled if we had discovered this in the early playtesting phases of making the game. 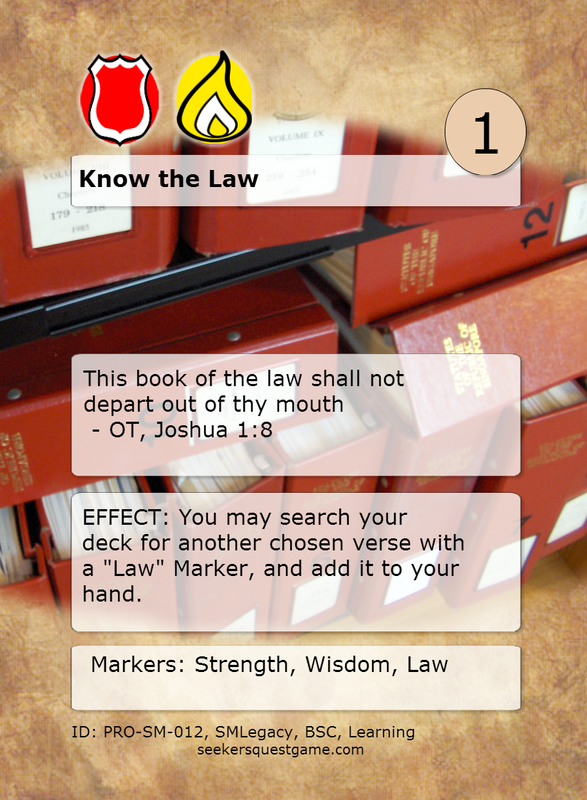 Instead, it came to light after the cards were designed and already available to the public! Yikes! Seriously, I was quite dejected. But, soon after, I regrouped, and he and I started talking about ways to "nerf" the verses in question. Let me explain that. In his video/online gaming circles, if a game company makes a facet of a game weaker or harder to use, it has been "nerfed". To understand this word, think of a real sword, and next to it, a Nerf sword. That should clear up any confusion. 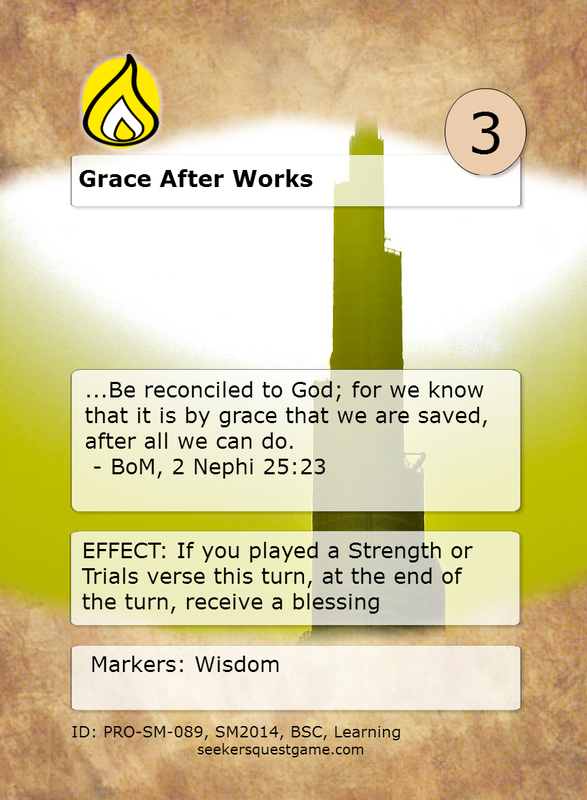 So, we had to nerf the blessing draw verses, and we did that by setting it up so that after receiving the blessing, you end your turn. That way, the other guy gets to play. 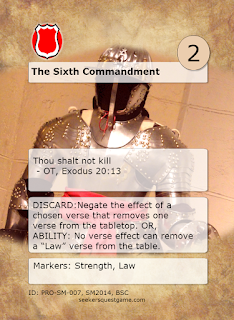 We also nerfed the verse draws, so that they're not so many, or for greater cost. 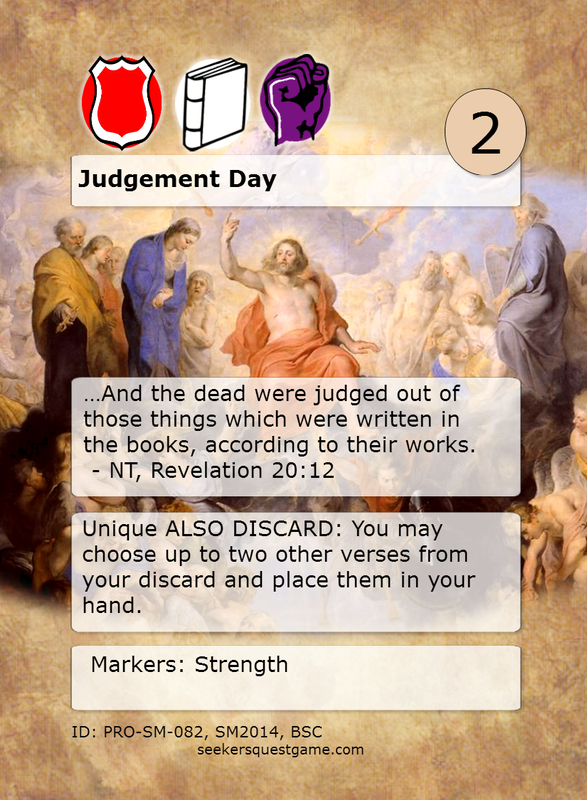 And, the few verses that pull from the discard, like "Judgement Day" don't pull quite so many, so easily. 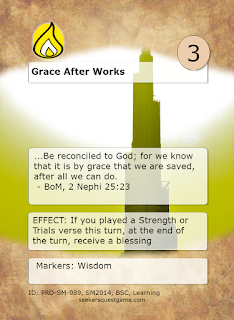 That meant that I had to rework the graphics of the verses, and re-upload them into The Game Crafter's website. It took me a while to do all that, but it's done, now. 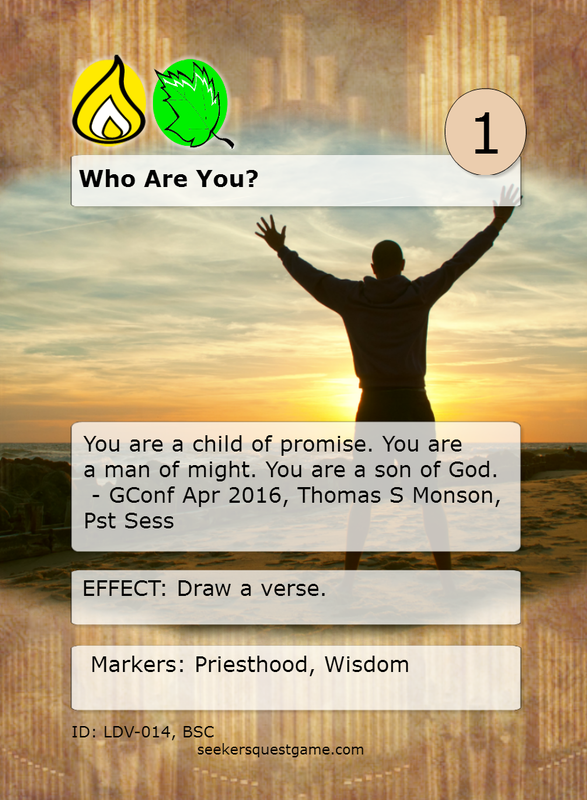 Anyone who buys any of the Seeker's Quest products (Full games, boosters, or pre-con decks) will all contain the new versions of the verses. There are a few of you who have bought the game already, and for you, if you contact me, and tell me which game set you bought, I'll make up a special booster with the right cards and get it sent off to you.